I have had the honor of hosting the 21st round of Grow Your Own, an always fun, always informative food blogging event which is the brainchild of Andrea's Recipes. Grow Your Own (GYO) has grown to become a twice-monthly project "that celebrates the foods we grow or raise ourselves and the dishes we make using our homegrown products" (from Andrea's Recipes). On the tiny island of Hong Kong, effervescent Rita of Mochochocolata-Rita has no backyard or balcony for growing her own garden, but undaunted by a lack of real estate and by being a self-described "plant murderer" (her writing is very funny) she has taken over the care and feeding of a potted mint plant, named "mint jai", and used some of "his" carefully suntanned and watered leaves to make delectable Lamb in Creamy Coconut Milk and Mint. 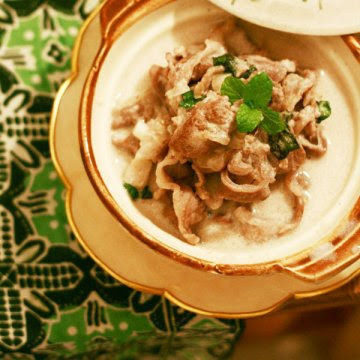 Gay's blog, A Scientist in the Kitchen, offers another scrumptious dish from the Philippines, Inihaw na Liempo and Dill. Inihaw na Liempo is grilled pork belly, which Gay cooked up at a recent Sunday picnic in the garden. She chopped up the pork and tossed it with tomatoes, onions, soy sauce, Thai chilies, homegrown dill, and calamansi juice. Calamansis are a kind of citrus fruit grown in Southeast Asia. What a delicious combination of flavors! From the Philippines we head west and north to arrive in the Mediterranean city of Athens, Greece, where Ivy of Kopiaste...to Greek Hospitality invites us to share some Tyrokafteri, a spicy cheese dip made with feta and Xynomyzithra, a sheep's milk cheese that her relatives from Crete made from their own flock. When there were no chili peppers to be had at the market for Ivy's traditional Tyrokafteri recipe, she improvised with harissa and roasted green bell peppers and a new recipe was born! Ivy is also organizing a new initiative to raise funds and awareness about hunger issues through Blogger Aid, so be sure to visit her site to learn more. 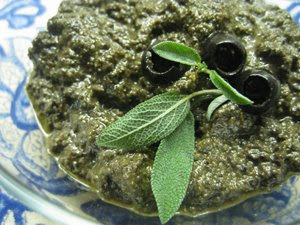 From Greece we trek north to Hamburg, Germany, where PG of My Kitchen Stories tempts us with Black Olive and Sage Pesto. The sage is from her garden and she used her aromatic pesto as a topping on toasted bread and mixed with zucchini, mushrooms and other ingredients for a heavenly sounding pasta dish. 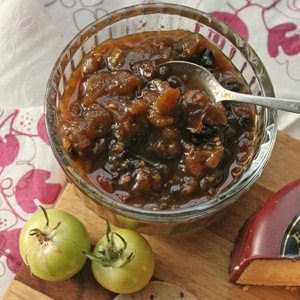 On to London, England, where two food bloggers provided two seasonal entries using homegrown apples. Abby of Eat the Right Stuff tried her hand at Apple and Lemon Curd, a favorite bread spread remembered from her childhood days. 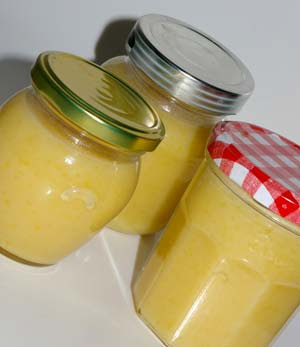 Using apples from a friends' trees and an overabundance of lemons from a supermarket order mixup (when life hands you lemons....) Abby whipped up 5 jars of curd from butter, lemons, apples, sugar and eggs. While curd is perishable and must be eaten within 4-6 weeks, she reports that only one jar was left after only three weeks, so you know this recipe must be a treat! Jeanne is a transplant from South Africa living in London and blogging about food, gardening, travel and photography at Cook Sister!. She was also in food preservation mode and tried hot water bath canning for the first time with a batch of Spicy Green Tomato and Apple Chutney. Bravo Cook Sister! That made good use of some of the numerous green tomatoes she was tenderly rearing during a decidedly unsunny English summer. Crossing the pond, we arrive at the southern United States and into Nashville, Tennessee, home of country music and Tamra, the food blogger author of Eat Seasonally. Tamra participates for the first time in Grow Your Own with a savory Pumpkin Coconut Soup using pumpkin and cilantro from her garden. This recipe tempted me so that I have a can of coconut milk in the pantry awaiting its marriage with a certain winter squash from our garden. Perhaps dinner tonight? Welcome to GYO Tamra and I look forward to more of your homegrown recipes. Heading east in to Virginia, we visit our Founding Mother, Andrea of Andrea's Recipes, who used homemade vegetable broth and sage from her garden to whip up a batch of Risotto with Onions and Sage. 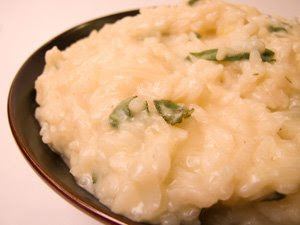 Andrea served this elegant risotto with her Thanksgiving turkey and that must have been some feast! Making risotto is a time-consuming but not difficult cooking skill if you follow Andrea's instructions (guided by Italian kitchen goddess Marcella Hazan), but you do need patience and a strong stirring arm. The final leg of our culinary journey takes us north to my Zone 4 garden in upstate New York. Rachel, the Crispy Cook, has only a few windburned Brussels Sprouts plants and a hardy thyme plant soldiering on. For my GYO entry I headed to the freezer, where I have several bags of frozen, blanched green soybeans. 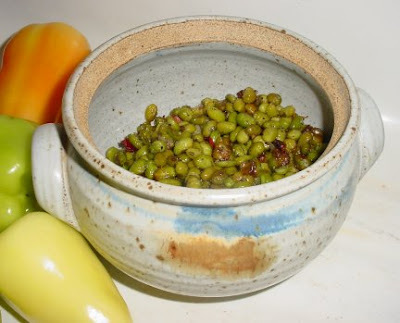 We harvested these easy-to-grow legumes from seeds we saved over the last several years and they are great steamed green and sprinkled with kosher salt in the Japanese manner, as Edamame, or tossed into stir-fries. I tried Roasted Soybeans for the first time with my GYO entry and they were delectable. I hope you all have enjoyed this peek into the kitchens and gardens of fabulous cooks from around the world. I know I have enjoyed this armchair travel and learned a few new things about food from my other blogging buddies. Thanks to all who contributed their recipes and insights. 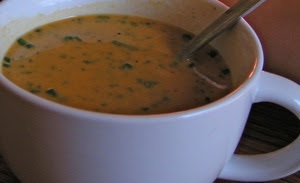 And now off to make Tamra's Pumpkin Coconut Soup! The next round of Grow Your Own will be hosted by Andrea herself at Andrea's Recipes, so be sure to visit to see what's in season and in the cooking pot. Andrea is looking for more guest hosts for future GYO adventures so visit her wonderful site to learn more. Lovely roundup Rachel with so many recipes I would like to try. You did a great job on the roundup, and once again I'm excited by all the variety. I'm planning to have soybeans in my garden next summer (expect an email from me soon). Thanks for being a wonderful host. What a great roundup! I truly enjoy your wonderful descriptions of each entry, Rachel! Well done!